I’ve often told people in the East that I thought of myself as a Westerner. I love the West, I’d say. I’d tell them about going to college in Arizona, my love of the Oregon coast, and some story about smoking a cigar on a car hood in Coeur d’Alene, Idaho. I never had to say much more than that. That was always strange enough for most people. In the circles I’ve lived in for many years now, the West is just some blank spots on the left side of the map. My pals in Maryland could no more pick Montana out on a map than I can drive past a Taco Bell without stopping in for a taste. In the past week, we’ve been moving around in western South Dakota, Wyoming, and now Montana. Big empty states. Beautiful empty highways that are always snaking through badlands or hills, pastures, wheat fields, and then mountains. Twenty-four black Angus cows, steers, whatever, all lined up by a lone tree. Actual cowboys moving a herd of cattle down the side of the highway outside Aladdin, Wyoming, population 15. Endless and stoic power lines disappearing into the horizon in Crawford county. 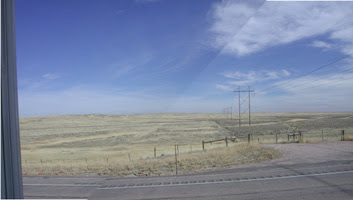 As we left the badlands and high prairie grasslands of South Dakota, we started to get into hills through eastern Wyoming, and by the time we got to Buffalo, in the north central part of the state, we could see parts of the Rocky Mountains looming ahead of us. From Buffalo to Butte, Montana, we climbed from 3000 feet to nearly 6500. It’s not the easiest thing in the world to encourage a 29 foot motorhome up to 6500 feet. It’s a lot like getting me out of a hammock. But we eased off the gas, hugged the right hand lane with some semis and moving vans, and ended up crossing the Continental Divide at a brisk 40 mph. And every mile over the past few days has been stunning. The land out here just eats you up. In South Dakota, it’s the horizon that kills you. It’s everywhere. You look any direction and see the earth moving away from you. But now in Montana, there are hills and mountains on every side, the highest of them snowcapped, despite the fact that we’re in our third or fourth 70+ degree day in late October, breaking records all over. We spent the day in Missoula, a pretty western college town with art galleries, ranchers, college students, artisans, and hippies. We spent some time at a Kinko’s, doing some work for this book, and nipped out for lunch at one of a hundred quaint cafes. One thing that has really struck me since being here this time is the very real and important role nature has in the lives of Westerners. In the east, the lack of rain or snow in a normal winter is weather talk. Here, it’s different. The environment is not just an abstract topic of discussion. The health and well being of the land, the watershed, the trees, all of it is crucial to the simple survival of the people, their homes, and the way of life. While talking with an old timer on a bench outside the café, I asked about the snow the past couple of winters. It’s been down, I know, and I was really just asking for something to say. In my head, I sort of expected something like, “Yeah, nice warm winters. It’s been great.” But instead, the old guy says, “Yeah, it’s been terrible. Not enough snow, so no runoff. The lakes are down, the rivers are down. The forests are dry and brittle. We had 400,000 acres of fires this summer.” They lost firefighters out here, right from Missoula. Lost homes. Lost animals. The beautiful and living land was scorched. Trees that have stood for a hundred years or more lost in a flash. We wandered back to a small car we had rented in order to get around and do some errands, but I kept thinking about the conversation, and all the things I’d seen in the past few days. People are tougher in the west. You see houses and farms up mountains, perched on cliffs or just butted at the end of long dirt roads. It gets cold out here, and the snow does come, and these folks are cut off from the world for a while. Ranch after ranch we passed with hundreds of hay bales already saved, covered, put aside for animals all winter. These hay stacks tower above the fields, some covered with tarps or wood. Each house has a wall of firewood at least 6 feet tall, sometimes 40 feet long. Firewood for a nice fire, perhaps, but usually for heat, and sometimes to get them through a hard stretch.